On March 23 I led a group of 8 on the first photowalk put on by Santa Clara Valley Audubon. Over 3 and a half hours, we found 45 species and had a good time talking birds, cameras and birding opportunities at the Baylands. We split our time between the area near the Marshes around the Lucy Evans building, out on the newly reconstructed (and now open!) boardwalk out to the bay, and near the duck pond waiting (without reward) for the reported and newly arrived Bullock’s Oriole see there the day before. Species highlights found included Blue-Winged teal, American Wigeon, Long-billed Curlew, Bonaparte’s Gull, Greater Yellowlegs, Peregrine Falcon (!!!! ), and a Bewicks’s Wren. Swallows are starting to nest, and we got nice looks at both Cliff Swallows starting to explore the eaves of the Lucy Evans building and Barn Swallows doing the same underneath. My photo set has a couple of not as horrible as I expected shots of the Cliff Swallows flying up into the eaves. The Bonaparte’s Gulls are a nice treat. They’re known to visit the pond in winter at times, and we had a small flock fly in and land, sit for views for about a minute, and then head out again. The Peregrine was an absolute joy. 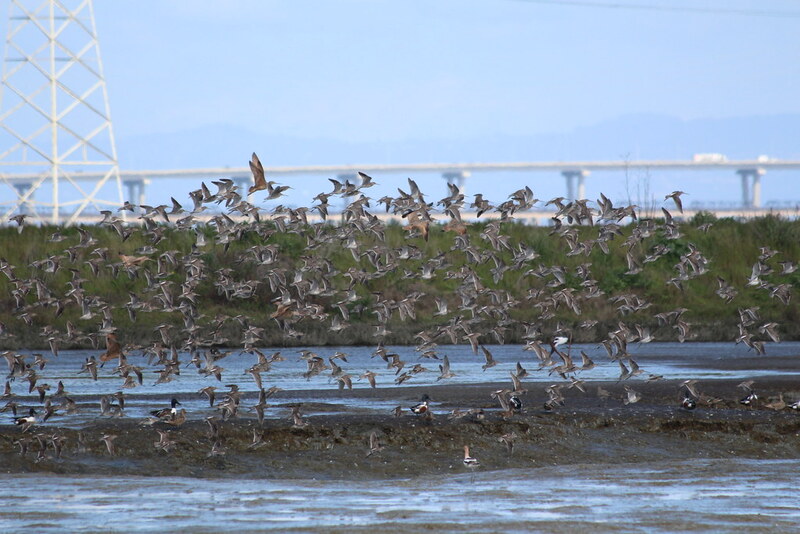 Literally as we were starting to pack up we had a flock of Dowitchers panic flight, and looking for the cause we saw a fast silvery bird chasing the flock. That bird was then attacked by a second fast silvery bird, and they chased each other for a bit before the first bird gave it up and left the area. The second bird flew some victory laps around the duck pond, giving us very good looks at the Peregrine falcon’s football helmet, shape and feather texture. I am sure the first bird was also a Peregrine but we never got a good enough look to say so definitively. PreviousShoreline Lake Big Sit report: 54 species!